The Chamorro people (/tʃɑˈmɔroʊ/)  are the indigenous people of the Mariana Islands; politically divided between the United States territory of Guam and the Commonwealth of the Northern Mariana Islands in Micronesia. Today, significant Chamorro populations also exist in several U.S. states including Hawaii, California, Washington, Texas, Tennessee, Oregon, and Nevada. According to the 2000 Census, approximately 65,000 people of Chamorro ancestry live in Guam and another 19,000 live in the Northern Marianas. Another 93,000 live outside the Marianas in Hawaii and the West Coast of the United States. The Chamorros are primarily Austronesian, but many also have European (Spanish) and East Asian ancestry. According to early Chamorro legend, the world was created by a twin brother and sister, Puntan and Fu'uña. As he lay dying, Puntan instructed his sister Fu'uña to make his body into the ingredients of the universe. She used his eyes to create the Sun and Moon, his eyebrows to make rainbows, and most of the rest of his parts into various features of the Earth. Once her work was complete, she descended on an island called Guåhan (Guam), and transformed herself into a giant rock. This rock split, and from it emerged all human beings. Some believe that this rock was once located at the site of a church in Agat, while others believe it is the phallic-shaped Laso de Fua located in Fouha Bay in Umatac. Chamorro society was divided into two main castes, and continued to be so for well over a century after the Spanish first arrived. According to historical records provided by Europeans such as Father Charles Le Gobien, there appeared to be racial differences between the subservient Manachang caste, and the higher Chamor[r]i, the Manachang being described as shorter, darker-skinned, and physically less hardy than the Chamori. The Chamori caste was further subdivided into the upper-middle class Achoti/Acha'ot and the highest, the ruling Matua/Matao class. Achoti could gain status as Matua, and Matua could be reduced to Achoti, but Manachang were born and died as such and had no recourse to improve their station. Members of the Manachang and the Chamori were not permitted to intermingle. All three classes performed physical labor, but had specifically different duties. Le Gobien theorized that Chamorro society comprised the geographical convergence of peoples of different ethnic origins. This idea may be supportable by the evidence of linguistic characteristics of the Chamorro language and social customs. Traditional beliefs among the Chamorro include tales of taotaomo'na and birak, as well as the Spanish-introduced concepts of duendes and hauntings in places such as in Yona, other old buildings, schools, hotel elevators, and the Ma’ina bridge. Taotaomo'na are spirits of ancient Chamorros. Birak is a broader term that may refer not only to the undead, but also to demons or general elemental types. Over the centuries, the Mariana Islands have been occupied by several foreign countries ( Spain, Germany, Japan, United States), and present-day Chamoru society is almost entirely multiethnic, with the inhabitants of Luta/ Rota being the least so. 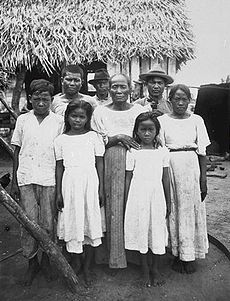 The Chamoru are primarily of Austronesian ancestry, but began to significantly interact with Spanish and Filipinos during the Spanish Colonial Era (1521–1898 AD). Primarily since the late 19th century onward, many Chamorus have intermarried with other Pacific Islanders, mainland Americans, Filipinos, Chinese, and Japanese. During the Spanish Colonial Era, the Chamoru population was greatly reduced by the introduction of European diseases and changes in society as well as all out war under Spanish rule. The Spanish killed many Chamoru men and relocated most others to Guam, where they lived in several parishes to prevent rebellion. Some[ who?] estimate that as many as 100,000 Chamorus may have populated the Marianas when Europeans first settled in 1667. By 1800, there were under 1,000. [ citation needed] Within the parishes, the Spanish eventually focused their efforts on converting the natives to Catholicism. Father Frances X. Hezel stated that Chamorus caught or reported engaging in pagan "sorcery" were publicly punished. Through this, they were given Spanish surnames through Catálogo Alfabético de Apellidos or Alphabetic Catalog of Surnames. Thus, a multiracially mixed Chamorro with European descent and a Spanish surname may not necessarily have Spanish blood, any more than Filipinos with Spanish surnames do. Most Chamorros are Roman Catholic  and few in the Marianas still maintain some customs and beliefs from the time before the first European conquests; some residents of the Marianas will still ask permission from ancestral spirits before entering parts of jungles. Archeological evidence from islands in the Marianas reveals that rice was cultivated there since prehistory. Red rice made with achoti is a distinct staple food that strongly identifies Chamoru cuisine among the many dishes of fellow Pacific island cultures. It is commonly served for special events, such as parties (gupot or "fiestas"), nobenas, and occasions such as a high school or college graduations. Fruits such as lemmai, mangga, niyok, and bilimbines are consumed in various local recipes. In the Marianas, Korean, Chinese, Japanese, and American cuisine are also commonly available. Local cookies are known as Guyuria. ^ "Ethnic Origin or Race: 2010 Commonwealth of the Northern Mariana Islands Summary File". census.gov\publisher= US Census Bureau. Retrieved 11 August 2017. ^ Durand; et al. "Diabetes in the indigenous population of the Commonwealth of the Northern Mariana Islands". Asia Pac J Public Health. 9: 28–32. doi: 10.1177/101053959700900106. PMID 10050196. Wikimedia Commons has media related to Chamorro people.